The name Nina Ricci is synonymous with sophistication, femininity and luxurious style. Her pioneering fashions have delighted since the 30s, a hallmark of elegance that combined sumptuous materials and soft tailoring. In attempting to channel the sentiment and personality of every woman, Nina proposed a feeling of classicalism and naturalness over the more flamboyant fashions of the time. This tradition continues today, with the art of the couturier present in every aspect of the house's fashion and fragrance lines. Experience the chic of Parisian couture with a youthful sparkle that is so very Nina. After 20 years of refining her art, Italian-born Parisian Nina Ricci established her fashion house in 1932 at the age of 49. While Nina designed and made the dresses, her only son Robert Ricci handled the business side of the House. Thus began a partnership would triumph throughout the otherwise sombre 1940s, and would ultimately last until Nina's retirement in the 1950s. During this time, the house flourished with its romantic collections and its subsequent international acclaim. This was helped along by the release of a series of fragrances in the late 1940s, most notably L'Air du Temps. The floral scent marked a great triumph for the House of Nina Ricci and it was lauded a great success. Today, L'Air du Temps is an icon; a fragrance classic that has lasted the test of time thanks to its uplifting notes and beautiful dove flacon. After this triumph Robert Ricci dedicated his time to the artistry of haute parfumerie, and gathered a team of artisanal perfumers to consolidate the house's international reputation. 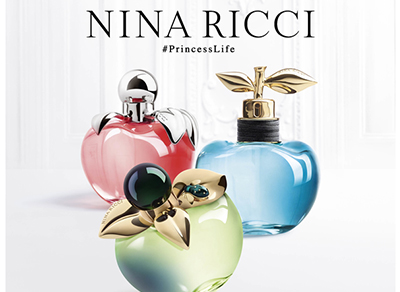 Their passion has translated into the Nina Ricci fragrance brand that we know and love today. With classics such as Ricci Ricci, Nina, and Premier Jour, the House inspires dreams and triggers the imagination still.